The parish of Clonmore launched there new website this month. Fr. John brought a wealth of previous knowledge with him and was involved every step of the way. He wanted an easy-to-use, easy to-up-date website, yet with a modern look and feel, with numerous features to help communicate with his community with ease and efficiency. Fr. John found that parishioners who couldn’t get to mass missed his homily greatly, so we included a feature called ‘From the PP’s desk’. Each week this is updated by Fr. John and past homily’s are also available to read back over. Other features include parish contacts, events calendar and death notices. Also the weekly newsletter and mass times calendar which has the time and date of the masses as they alternate from church to church, week to week! 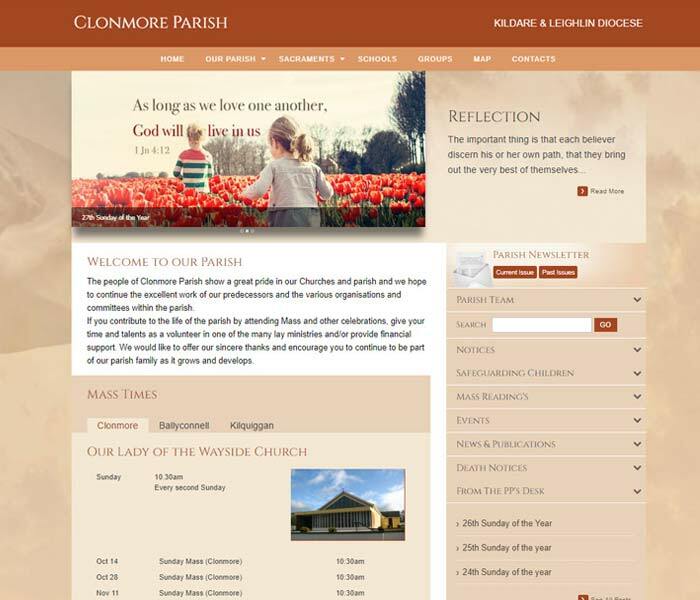 Clonmore Parish website is optimised for mobile and tablet, so keeping in touch with the whole community is easy – even when they are on the go!